There is something intrinsically satisfying about roasting a chicken. Versatile, economical, forgiving, and consistently delicious: a roast is perfect family dinner fare, and also worthy of casual entertaining. Expecting guests? Roast 2 chickens and double up on the ingredients. Variations abound. In our case, roast chicken often involves a rub, as minimal as simply salt or more embellished with olive oil, garlic, lemon, mustard. Add an Asian twist with grated ginger, or head to north Africa with coriander and cumin. 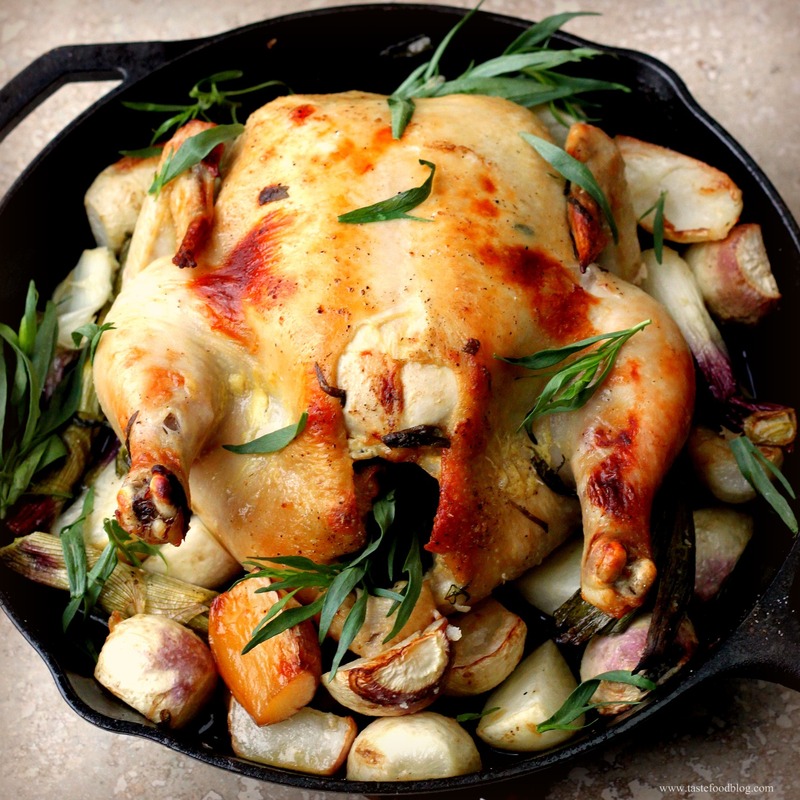 A favorite preparation is to roast the bird nestled in a pan with seasonal vegetables. As the chicken cooks, the vegetables brown and baste, adding to the flavor to the pan juices. This recipe takes advantage of spring’s new vegetables. Feel free to mix and match with what’s available. I used thick purple spring onions, white carrots and baby turnips. Onions, fennel and potatoes are also a sure thing. For a rustic family-style presentation, return the carved chicken to the skillet in which it roasted, amidst the vegetables and pan juices. Preheat oven to 400 F. Rinse and pat dry the chicken outside and inside the cavity. Whisk lemon juice, olive oil, mustard, 1 teaspoon salt and pepper together in a small bowl. Stir in the tarragon. Rub the 3/4 of the marinade all over the chicken – inside the cavity, outside, and between the skin and breast meat. Place turnips, carrots and onions in a bowl. Toss with remaining marinade. Dump the vegetables into a large cast iron skillet or roasting pan. Nestle the chicken, breast-side up, in the middle of the vegetables. Roast in the oven for 30 minutes. Remove; using tongs turn chicken over, breast-side down. Return to oven and roast 20 minutes. Remove; turn chicken one more time. Continue roasting until chicken is cooked through and juices run clear when a knife is inserted in the thigh, 20-30 minutes. Transfer chicken to a cutting board and tent with foil. Let rest 15 minutes. Carve the chicken and return to the skillet with the vegetables and juices. Serve. I love the combination of mustard and tarragon. It was an herb I discovered late in my adventures with fresh herbs, but I am sold on it now! I love tarragon. This looks delicious! Looks lovely. I, too, love a roast chicken for dinner. So simple to assemble – and so rewarding at the end of a day! That chicken looks amazing. And the strawberry recipe above, wow. Great blog. This chicken is so pretty! Random comment, I know. But it is just that! These days, it’s pretty hard to make time for preparing home-cooked meals because of our busy lifestyles but if we do want to stay fit and healthy we have to choose the kind of food that we eat or cook for our loved ones. Thank you for sharing such a wonderful idea on how to prepare chicken – the healthy way.